Sweeping coastlines that go on forever , Harlech beach and its famous sand dunes is just one example of the kind of quality that you should expect from the local coastline, complemented by magnificent views of the Snowdonia mountain ranges. Barmouth Bridge is very popular with visitors to Garthyfog Farm, allowing access to the picturesque coastal town of Barmouth. 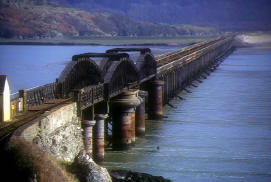 The bridge is conveniently located at the beginning of the Mawddach trail. Wildlife on the Welsh Coast is varied and interesting with dolphins and porpoise often visible in the summer. 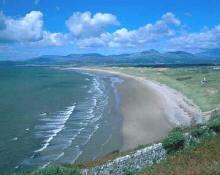 The RSPB center in Penmaenpool is 4.5 miles from Garthyfog Farm also along the Mawddach Trail. 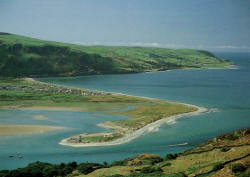 The Mawddach Estuary forms a particularly interesting feature of the coast. Garthyfog is situated at the mouth of the Mawddach Estuary, combining magnificent mountain and coastal views. Cader Idris almost 3000ft in height to the east, Bardsey Island and the Lleyn peninsula visible on a clear day to the North West. Click here to search the site for more sights and attractions.